Does this quote cause the hair on the back of your neck to rise slightly? Is Mr. Barr’s conclusion correct? Was it entirely by human reckoning that the books that comprise our Bibles today were chosen? I was recently confronted with similar suggestions. This confrontation led me to where I’m nearly always led… the book store. Looking forward to sharing my findings, and of course, getting a better grasp on the authenticity and reliability of the decision to canonize the twenty seven New Testament books we Protestants hold in our hands. After all, our faith is founded in its contents. 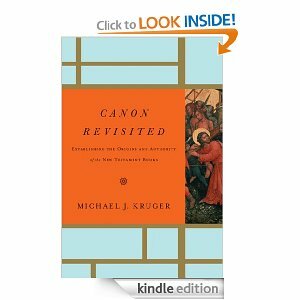 This entry was posted in Books and tagged Authority of the New Testament Books, Bible, Canon, Christianity, D. A. Carson, James Barr, John Piper, Monergism, New Testament, Old Testament, Religion and Spirituality. Bookmark the permalink. 12 Responses to Who Loaded My Canon? One of the many blessings of blogging is meeting people with such ideas and being able to counter their ideas with solid truth. In all my years of ministry, here at WordPress was the first time I came across the belief that “King James wrote the Bible after everything had already happened, so of course parts of it agree with history” and I have been told the same thing many times since. I suppose it is natural to think the King James Bible was written by King James so people can be excused, but not if they continue to believe that after it is explained. Every argument against the truth of the Bible can be countered. The devil will ensure there are arguments against it, but it is the Word of God and He has said it will endure forever. Looking forward to reading your conclusions. Sorry I have not been around in a while (holidays, travel, trying to stay healthy). I just wanted to let you know that I nominated you for the Blog of the year award. You can pick up the details at http://biltrix.com/2013/01/18/5-stars-thank-you/ . Hi Mike, so very good to hear you make a stand for God’s inspired word, it’s His Truth, His very Heart and He was the one who chose what would be accepted, that is why there is penalty spoken of in Revelations if we take away from His Truth or add to it, when it is done to deceive like the Cults do but of course we do have man’s errors in Translating but God will give us His discernment to recognise them. I have found with Cults that they will claim a Scripture was not in the original Manuscripts if it is not in agreement with their false teaching, the two below are examples. The first one confirms The Godhead or Trinity as we call them today , Jesus as shown in John 1 and other Scripture, is the Living Word. 1 John 5: 7 For there are three that bear witness in Heaven: The Father, The Word, and the Holy Spirit; and these three are one. The second is claimed by those who believe that regardless of the sin we commit even without heart repentance which means turning away from evil and doing good by The empowering of The Holy Spirit, that it is ok because we are forgiven but if we read both verses in context in the whole of the Chapters they are confirmed as God’s Truth regardless of what any man or woman claims was in the original Manuscripts. Continue to stand up for God’s Truth Mike, as you are seeking to do with all your heart and don’t worry I get upset with Deception and so does God even more than us, because He knows His Children will be hurt and He Loves us so much that He grieves when we are. very interesting….. looking forward to hearing the results! I like to believe that GOD is big enough to form the bible — the only true words to live by! You and me too Deidre. I think my interest here is more to be able to give “a defense for the faith I have,” than questioning the Word. What recently confronted me was a statement of how and when some of the NT texts made their way into our Bible. I had no intelligent answer. I intend to remedy that for future confrontations. When we speak of the formation of the Bible (New Testament), we have to remember that it was indeed the Church that determined which letters and books made the cut. There were a whole bunch of options circulating to choose from, so it was a very delicate process. Still, as you say, we trust that God was in (the Head of) the process. We’ll see where this author takes me… blessings good friend. Me either Chrystal… blessings good friend.